This very popular former village hall was used as a reading room, doctors surgery, playschool and a centre for 'Dad's Army' during the war. It's character has been preserved and the stage is now the kitchen. It is situated on a cycle route on the outskirts of a quiet village in the Suffolk countryside. This very popular hall has 2 bedrooms, a bathroom with seperate shower and toilet as well as a seperate toilet. The master bedroom has a six foot wide four poster bed with twin beds in the second bedroom. The stage and hall remain undivided giving a large open area. To the rear is a private patio and parking area with a natural meadow (not belonging to the property) We offer WiFi Sky TV. Single pets considered. The local grass airfield (see location map) is for light aircraft only so doesn't impact on the village but is handy should you own one. The Reading Room is a building of character and history. To the rear is a natural meadow, to one side a conservation area and the other a narrow copse. It is on the edge of a friendly village with very good facilities as well as being on a very well established cycle route. We will take single well behaved pets. Being a former villa hall the living area is large and with the former stage providing the kitchen area it makes it that much more sociable. The bathroom has a bath, shower, wash basin and toilet. The seperate loo has a hand basin. The Reading Room is situated on the edge of a village and on a recognised cycle route. 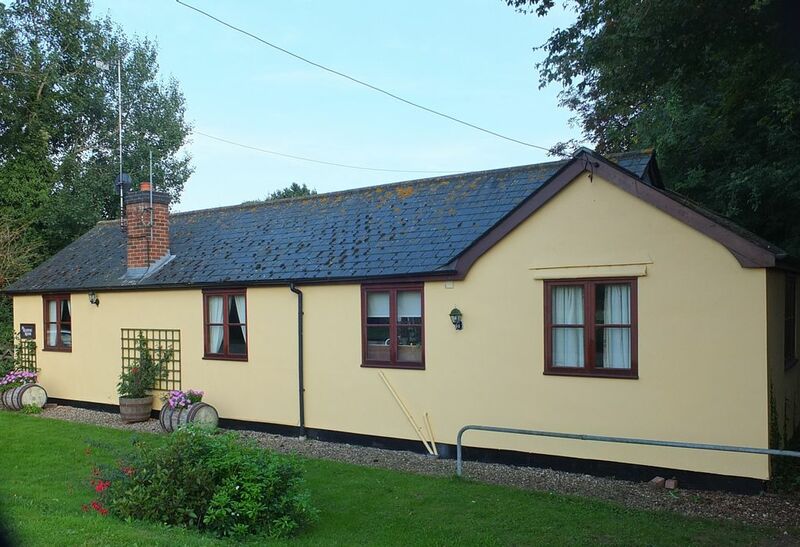 Ideally situated for exploring Suffolk and getting on the A14 or the A12. The Reading Room is situated on the edge of a village that unusually still has a PH, a General Store, & both Methodist and C of E churches. There is also a playing field & a village hall. The main hall of this former village hall is the living room with Sky TV, CD player, electric heating. The Hall was formerly rated by a leading holiday rental company as 'Lovely'. The stage is the kitchen which is well equipped with an electric hob, oven, microwave, dishwasher, washing machine and all you should require. Hintlesham Golf Course, which is quite special, is a couple of miles away. Notes on accommodation: This property has been unavailable for holiday rental for over 2 years to help a local person with accommodation. Prior to this it was rented through a major rental company rather than directly from us. We experienced an amazing 45+ week rental take up, which gives you some insight into the property and this area of Suffolk. We can only suggest that you google Hadleigh, Dedham, Constable, Bury St. Edmunds, Cambridge, Ipswich, Lavenham and Kersey to find out about the area. We hope that we know what our visitors require as we have been in holiday rentals in the UK and France for over 10 years. 32" TV with Sky+ Box. Broadband access. Outside: To the front of the property is mainly grass and to the rear it is all block paved and fenced and very private. There is a BBQ plus a table and chairs. Cleaning / Towels / Linen / Maid service: Towels, tea towels and linen (except cot linen etc) are supplied and changed weekly. The property is cleaned between rentals but it is expected that it is left as close as possible to how it was found, on arrival. Felixstowe is about 45 minutes by road and don't let the fact that it is a container port discourage you, as Old Felixstowe is very pleasant. All of the Suffolk coastline is within easy reach. Stansted and Norwich airports are the closest to The Reading Room and a car is pretty well essential. Elmsett is 8 miles west of Ipswich, and the village has all the basic essentials including a general stores/post office, pub, hairdressers, COE and Methodist Churches. Kersey and Lavenham close by. All the facilities that you are likely to require whilst on holiday are in easy reach from The Reading Room. You can also look at our own website (link below). It needs to be stated that the pictures we are using are from 3 years ago and the look and decor may vary from these pictures. Booking Notes: Booking is direct with the owners. We ask for a £150 per week deposit with the balance payable not less than 12 weeks before the arrival date. We take almost all forms of payment as we can process your credit cards should you require this. This can be done via the phone or through our own dedicated payment site. Changeover Day: The normal changeover day is Saturday and we ask you to vacate the property by 10am and access to the property is from 3pm onwards. Notes on prices: Prices are for the property per week in UK pounds. Bookings run Saturday to Saturday. For more dates please go to our own website. There are no additional charges. Everything is included and there are no booking fees. We do however ask for a £100 security deposit.